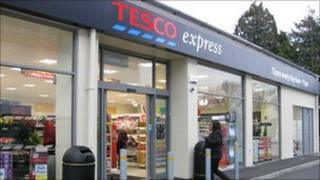 Traders in Ivybridge say they are worried about a new Tesco express store which has opened in the town. There is already a Tesco superstore about two miles away at Lee Mill and a Somerfield supermarket and two convenience stores in the town. Shopkeepers have put up signs in the town asking people to support traditional outlets. A Tesco spokeswoman said that the store would help bring in more shoppers to Ivybridge. Councillor Tony Barber said: "If you want to go to Tesco, it is only a couple of miles up the road. "It does seem as if Tesco is expanding at any cost. "I would welcome any increase in shopping opportunities, but Tesco is already competing massively with Ivybridge." He said butchers, a greengrocer and a baker were threatened by the store which will be open from 0600 to 2300 every day. Greengrocer Jan Taylor said: "They are offering parking, so people are going to drive there, get in their car and go home. "I don't think it's going to increase trade, in fact it will take away trade." Richard Peachey, chairman of Ivybridge Chamber of Commerce said the number of shoppers could rise. "Tesco has had a big superstore outside Ivybridge for about 30 years. "We have been competing with them for a long time. "We would certainly prefer them to be in the town with us, rather than outside taking business away." He added: "They are going to come here anyway, we can't stop them. "There will be some casualties, but there are a lot of specialist businesses that are not competing with Tesco." Melanie Chiswell of Tesco said: "In our experience Tesco express stores attract more shoppers into town centres. "In fact they act as anchors and encourage more people in and it is up to local shops to take advantage of that and encourage them in as well."